Marlin Steel is proud to offer the services of a precision cutting laser for the creation of custom metal forms from sheet metal plates. 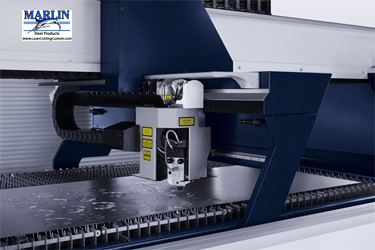 The Trumpf laser can make thousands of cuts in metal forms per hour, with every cut from the first to the last having the same micrometer level of precision. With this laser, cuts in sheet metal can be made very close to one another, which translates into more parts per sheet of metal used. Laser cutting has expanded Marlin Steel's sheet metal fabrication services. With the 2500 kW TRUMPF TruLaser 1030, we are able to accelerate production, cut costs, reduce scrap and master very tight measurement tolerances. Because of the quality of our operation, we were one of three U.S. companies to receive the prestigious Metalforming Pioneer Award in 2013 from the Precision Metalforming Association and The Hitachi Foundation. Laser fabrication can reduce material and production costs compared with milling out of solid material. Our tolerance on laser cuts ranges from +/- .002 on thin sheet metal to +/- .005 on thicker metals. The configurable setups on the TruLaser facilitate speed and efficiency. It allows us to load laser fabrications via a jib crane with a suction frame. Unloading finished custom stainless steel products is a smooth operation thanks to the movable pallet. Unlimited Design Freedom - Precision-cut laser fabrications. Customized - Precision laser cuts in any shape. 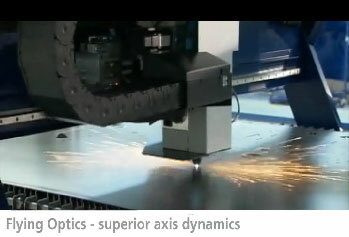 Eliminate Prototype Costs - The laser gets cuts right the first time and every time after that. The laser beam does not wear out like other tools. Cuts 0.6" (15 mm) thick steel. In addition to cutting standard materials such as stainless steel and aluminum, materials such as acrylic and wood can be processed reliably and effectively. minimizing time to market for your parts. 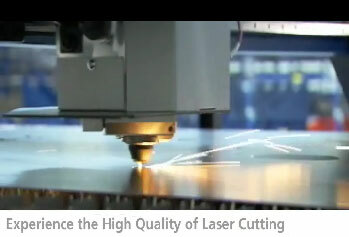 Lasers reduce or eliminate secondary processes - This speeds up production and increases productivity. Cuts 61 feet per minute (18m/m). Quick laser fabrication re-production - Reordering parts at a later date is fast and simple. Cost savings are possible because intricate cuts are closely spaced, yielding more parts per sheet. Precision cutting tools process 5'x10' sheets - less scrap and waste. Lasers robotics allow us to work touch-free. Minimal distortion of the workpiece. Extremely accurate taper cuts are achievable. Intricate cuts can be made with precision. Other sheet processing methods apply massive tools to the material with enormous mechanical force. The workpiece being cut with a laser does not experience a mechanical load. Lasers can produce fine contours and structures with great precision. The heated zone is very small; the rest of the work piece is subjected to little or no heat. The Marlin Steel TruLaser 1030 handles laser cutting jobs in 5 steps. We are able to manually load and unload materials ready for laser fabrication for careful inspection and handling because of the easy accessibility from the front, back and sides of our laser robot. The loading of laser fabrications is accomplished via a jib crane with a suction frame. Unloading the finished products cut by the laser is equally smooth due to the movable pallet. It's all a part of ensuring that "made in the U.S.A." quality in our precision laser fabrications.